Modern bathroom ceilings are taking a whole new shape, thanks to the latest technology and astounding creativity of professional designers. Be it a floral ceiling, fabric stripes ceiling or an intricately painted ceiling, you can get it done in any style imaginable. 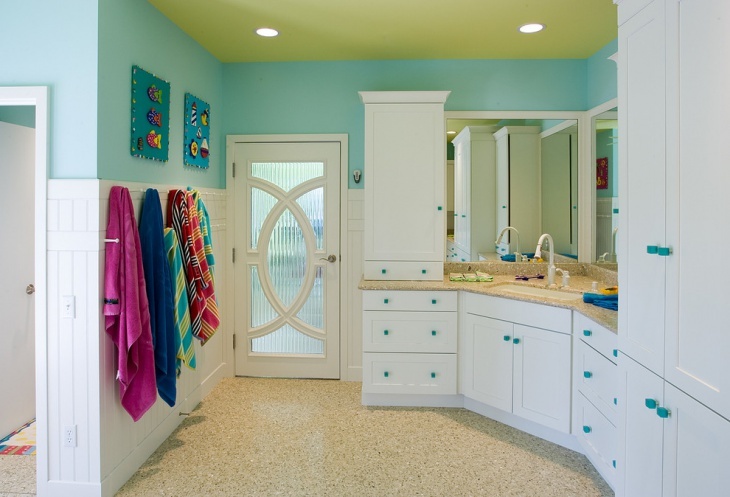 Feel fresh and rejuvenated, every time you step into your fancy bathroom. 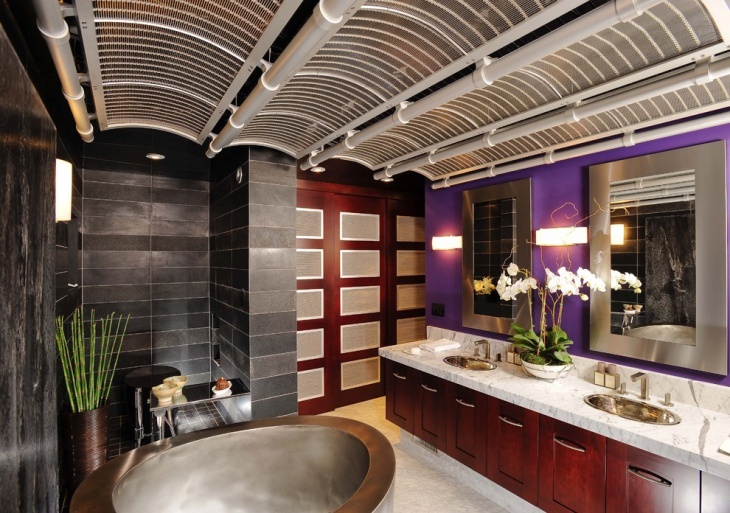 Check out these amazing ideas to design your bathroom ceilings. 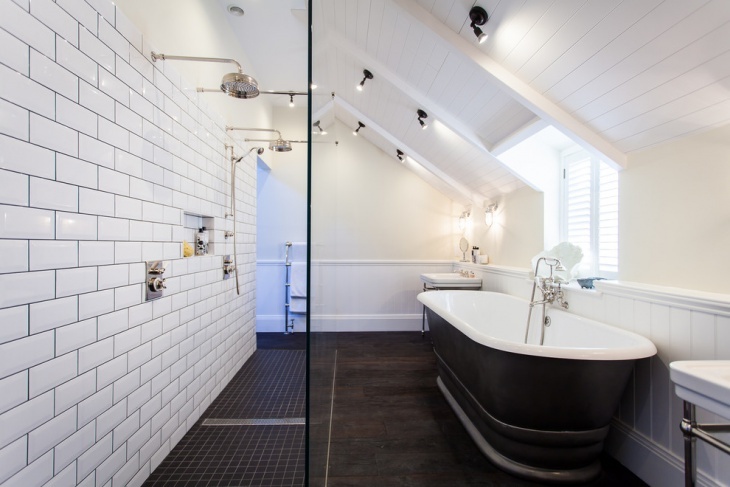 Add a new dimension to your bathroom top with eclectic ceiling tiles. You can go for faux brick ceiling using tiles to complement wood flooring. An all white bathroom ceiling is best suitable for dim lit bathrooms. The white ceiling tiles reflect sunlight around the bathroom, making it appear larger. Create the ambiance that suits your style by choosing the right color for your bathroom ceiling. Dark colors render warmth and coziness to the bathroom. The deep blue colored ceiling looks royal, dramatic and makes the room appear larger, by drawing the focus upwards. If you find the suspended ceiling in the bathroom sagging or flaking, it’s time to remodel it with a suitable ceiling panel. You can easily install it over existing wooden cladding or joint compound finishes. Ceiling panels are highly functional and durable. A dark colored ceiling panel creates a sober, subdued atmosphere. Ceiling cladding is a great way of giving your bathroom a new makeover. It adds style to your bathroom, whilst protecting it from the ill-effects of moisture. A pure white grooved ceiling cladding creates a stylish appeal and is suitable for modern bathrooms. 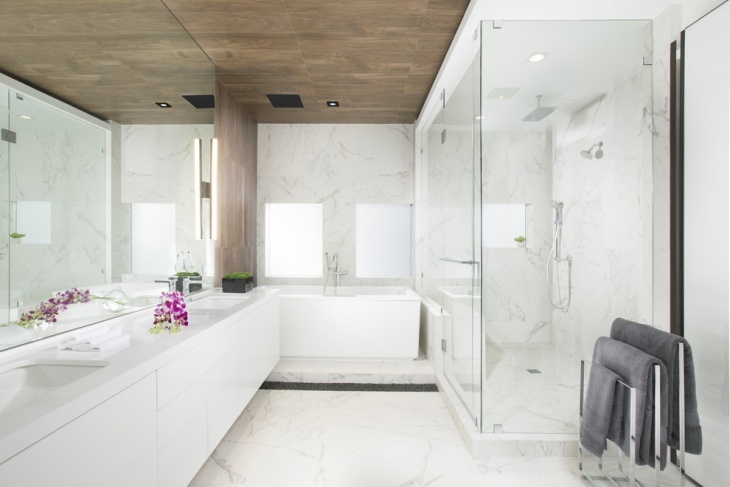 For a spacious bathroom, it is ideal to go for multiple layers in order to create a luxurious appeal, suggests designer Scott Arthur Yerkey. Brighten the area around the bathtub by hanging decorative lights over it. 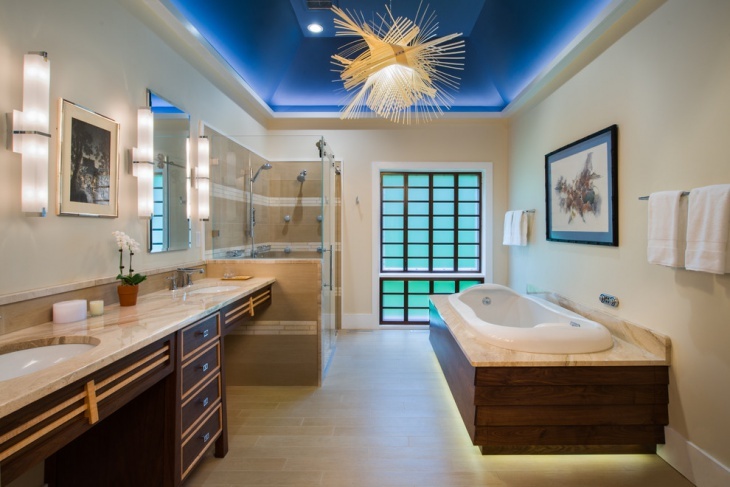 Recessed lights help in illuminating the entire bathroom beautifully. Wood is not just suitable for floors but can also look great on the bathroom ceiling. 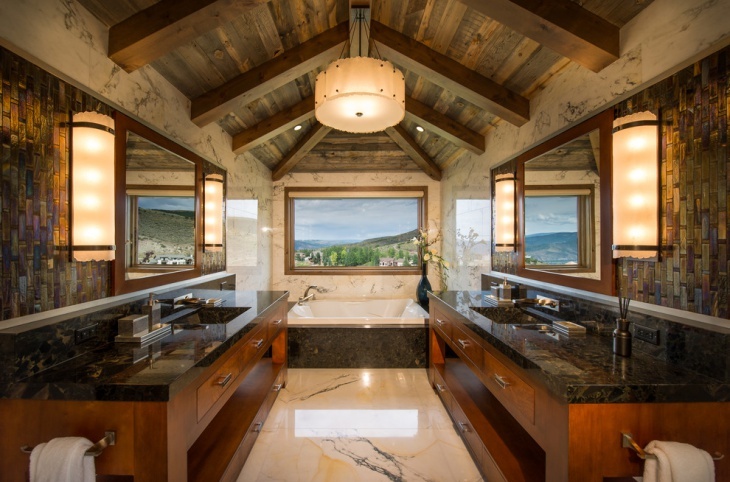 Geometric ceiling design in wood renders natural warmth to the bathroom. 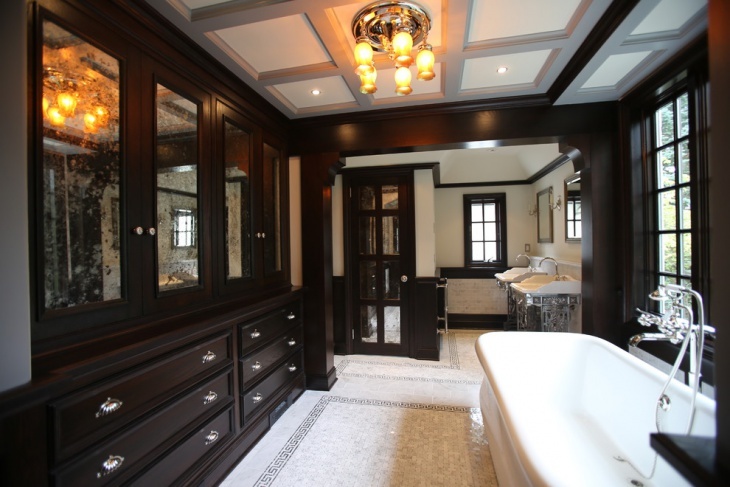 You can go for dark colored oak or walnut cladding to match with lightly shaded fixtures in a modern bathroom. Create visual appeal, flexibility and interest in your bathroom with POP ceiling design. You have a variety of styles and color options to choose from. White color is the most preferred choice when it comes to POP ceiling. Painting the ceiling in a shade lighter than the walls and fixtures suits a small bathroom perfectly. 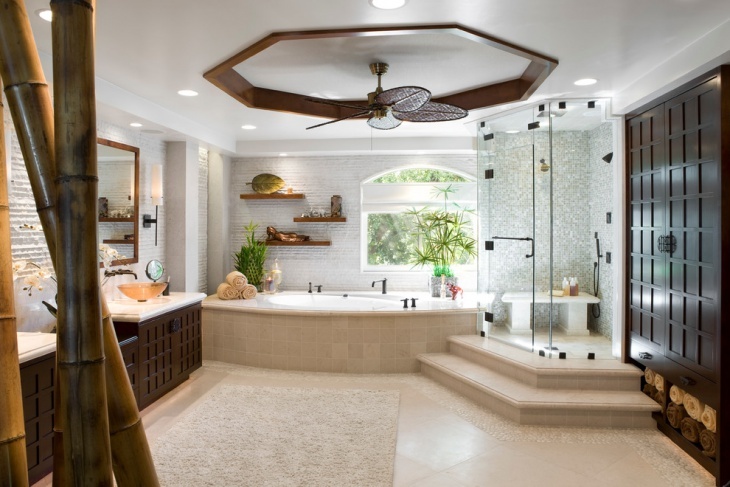 Go with curved ceiling concept for your bathroom to give it a fresh look. Metal ceilings and wood plank offer resistance from sagging. Plywood gives a great finishing touch to the curved surfaces. 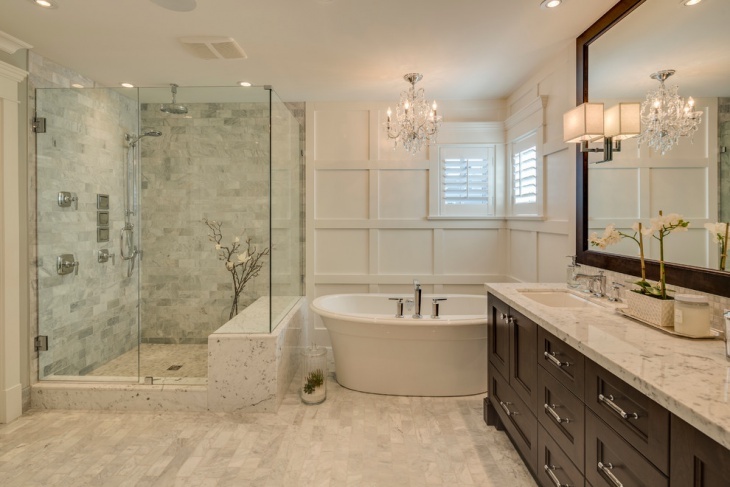 Round glass ceiling adorned with a crystal chandelier makes the bathroom appear brighter. Spend your lazy evenings gazing at the star studded sky, while relaxing in your tub under a skylight bathroom ceiling. 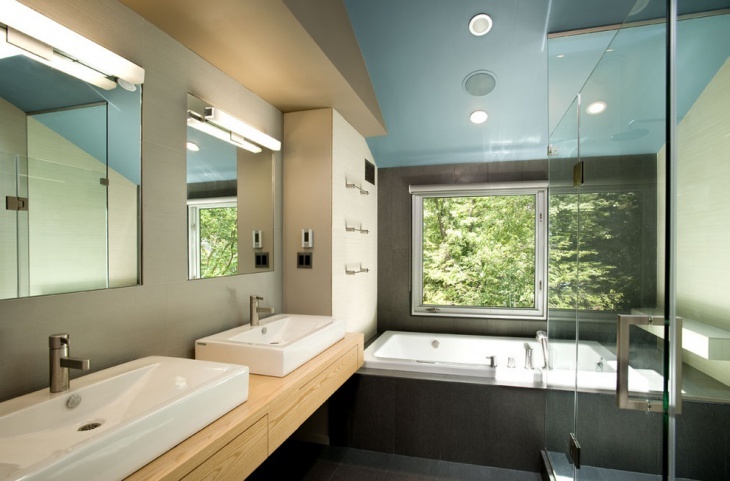 A skylight allows natural sunlight into the bathroom, making it brighter and spacious in appearance. Skylight ceiling adds a fascinating feel to the bathroom. Drop ceilings not only give your bathroom a makeover but are also effective in resisting mold and sagging. Drop ceiling tiles are a great way of hiding unsightly fixtures, while making a style statement. A beamed ceiling is offen an inexpensive way of styling a small bathroom. The next time you plan on remodeling your bathroom ceiling, try something unique and innovative with the ideas listed above. Create an exciting atmosphere in the bathroom and let the ceiling reflect your style.